Isn't this flower ring adorable? I'm so going to make one of these. 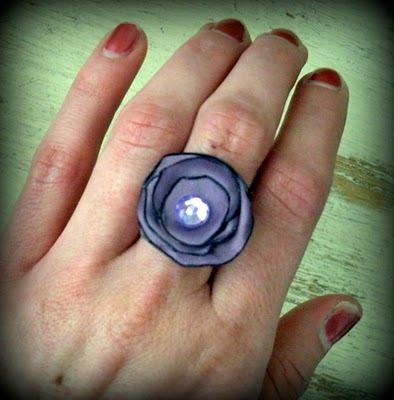 To see how to make it click here: "SweetCharli"
Then hot glue your flower onto your ring base and you're done! - 1 1/2 in. silk or satin polyester ribbon (can be printed or just plain) note: you can use ribbed ribbon also, but hot glue sticks better to the silk. measure around your wrist, and add about and extra inch and 1/4.